Antoinette Love's Winter Spice Cake recipe has a crunch as she uses crisped rice treats inside the cake. 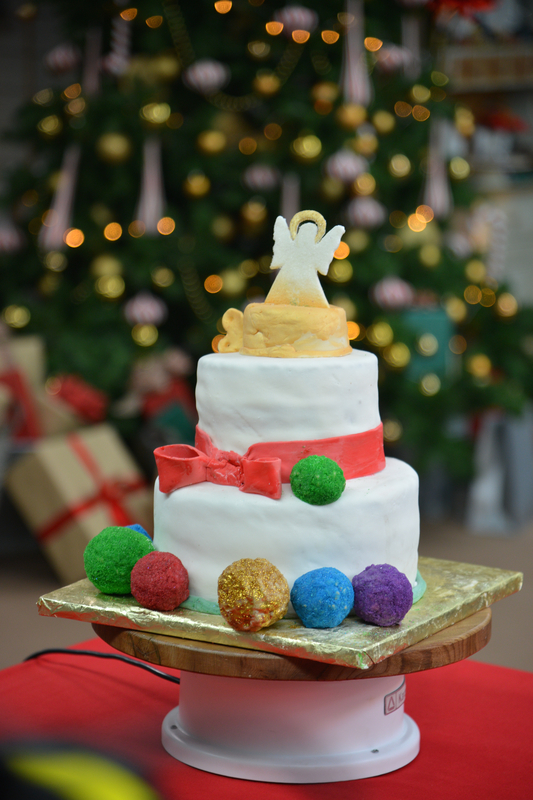 She also shows off her baking skills by using a balloon to create a transparent gelatin globe cake topper. She hopes to show the judges the best of what she can do with this layered spice cake during the first showstopper bake on season two episode 1 of The Great American Baking Show. Watch the full episode, "Cake Week," to find out if Antoinette's recipe is good enough to keep her in the tent. 1. Incorporate all dry ingredients excluding cranberries in a mixing bowl and set aside. 2. In a saucepan hydrate 1 cup dried cranberries with 1/2 teaspoon All Spice 1/3 cup water. Boil cranberries until soft. Set aside. 3. Cream butter sugar until fluffy. Beat in eggs one at a time. Mix in dry ingredients and the buttermilk starting with flour ending with flour. Once mixed fold in cranberries pour batter into pans. Bake for 20 minutes at 360 degrees Fahrenheit (180 degrees Celsius) or until done. Let cake cool completely. 4. While cake is cooling start on icing in a saucepan melt chocolate and milk together add the mixture to mixing bowl with power sugar and butter that has been creamed together. Start mixing and add vanilla. 5. Assemble cake with one layer cake and then add icing bottom cake should be three layers. This step should also be done for the top tier of the cake. 6. Cakes will be covered in a white chocolate ganache this will help support the fondant when added to the cake. 1. Warm ganache in saucepan when hot pour mixture over chocolate. Let chocolate cool off before applying to the cake. 1. I will need at least 4 balloons they will be blown up and secured with skewers tape. Place each sheet into a large bowl of ice water. Let the gelatin sheets sit for 10 minutes. After 10 minutes remove the sheet squeezing them until water is fully drained. Once the water is drained add gelatin to saucepan along with the 4 tablespoons of water. Once gelatin is fully dissolved remove and pour into a bowl. Once gelatin has cooled dip each balloon covering the whole balloon. Place the balloon Styrofoam to make sure it stays in place balloon in front of a fan and let it set for 3 ½ hours. 2. The cereal will be used to form the round ornaments that will be placed on the cake. 3. Each Christmas ornament will be decorated with edible luster dust some of the ornaments will be make with fondant but the larger ones will be made out of krispie treats and covered with fondant and decorated.